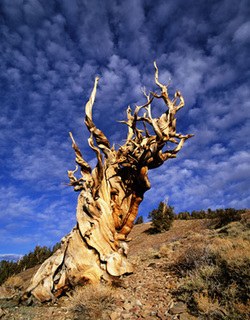 Prometheus - was the oldest known Great Basin Bristlecone Pine (Pinus longaeva) tree growing near the tree line on Wheeler Peak in eastern Nevada, United States. 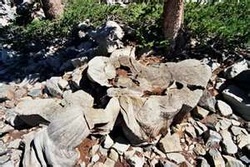 The tree, which was at least 4862 years old and possibly more than 5000 years, was cut down in 1964 by a graduate student and United States Forest Service personnel for research purposes. Prometheus was a living member of a population of bristlecone pine trees growing near the tree line on the lateral moraine of a former glacier on Wheeler Peak, in Great Basin National Park, eastern Nevada. Wheeler Peak is the highest mountain in the Snake Range, and the highest mountain entirely within the state of Nevada. The bristlecone pine population on this mountain is divided into at least two distinct sub-populations, one of which is accessible by a popular interpretive trail. Prometheus, however, grew in an area reachable only by off-trail hiking. 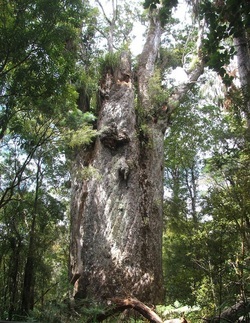 In either 1958 or 1961, a group of naturalists who admired the grove in which the tree grew gave names to a number of the largest or most distinctive trees, including Prometheus. Methuselah -is a Great Basin Bristlecone Pine (Pinus longaeva) tree growing high in the White Mountains of Inyo County in eastern California. 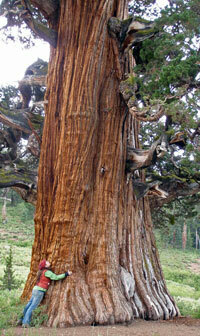 Its measured age of 4,842 years makes it the world's oldest known living tree. 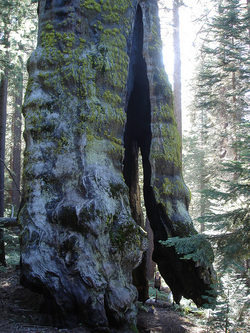 The ancient tree is named after Methuselah, a Biblical figure having the longest mentioned lifespan in the Bible of 969 years, its exact location remains a closely-held secret protected by the U.S. Forest Service. The picture is not an actual picture of Methuselah, but it likely looks very similar. Among the White Mountain specimens, the oldest trees are found on north-facing slopes, with an average of 2,000 years, as compared to the 1,000 year average on the southern slopes. The climate and the durability of their wood can preserve them long after death, with dead trees as old as 7,000 years persisting next to live ones. 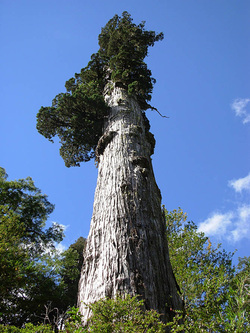 Alerce Tree: In 1993 scientists discovered this 150-foot tall Patagonian Cypress in the Andes Mountains of Chile. Unlike the Llangernyw Yew and the Sarv-e Abarqu, Alerce has been given an exact age of 3,637 years old using tree-ring width chronology. 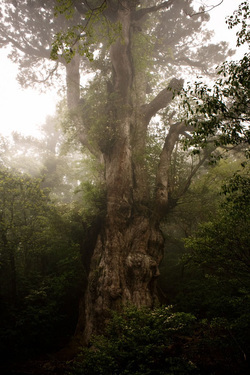 This makes it the second oldest tree to have its exact age calculated. The Muir Snag - (giant sequoia tree) Thought to be the oldest giant sequoia, this now dead tree is still standing but only at 140 feet (43 m) tall. It has a maximum base diameter of 35.9 feet (10.9 m) and before it died its perimeter could have been as much as 110 feet (34 m). This tree is thought to have been more than 3500 years old when it died. 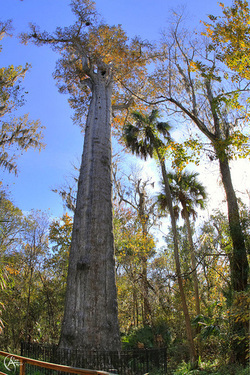 The Senator: This is a Bald Cypress located in Big Tree Park in Florida. It is estimated to be nearly 3,500 years old and was once used as a landmark by Seminole Indians and other local tribes. It also holds the title of biggest tree by volume east of the Mississippi. Juniperus Occidentalis - (Western Juniper and Sierra Juniper) is a shrub or tree native to the western United States, growing in mountains at altitudes of 800-3,000 m (rarely down to 100 m). The Bennett Juniper in the Stanislaus National Forest of California is considered the oldest and largest example at possibly 3000 years old, with a height of 26 m and a diameter of 3.88 m.
The Oldest Olive Tree - At the Santa Iria de Azóia,Lisbon, Portugal, , was certified last July 10 ,2011, a very ancient olive tree to be 2850 years. 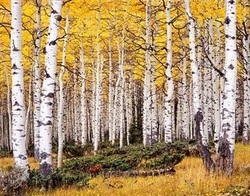 Pando: Also known as the Trembling Giant, Pando is a clonal colony of a single male Quaking Aspen located in Utah. Each genetically-identical individual tree (or “stem”) is connected by a single root system. Spreading across more than 100 acres, Pando is believed to be over 80,000 years old and collectively weighs over 6,600 tons, making it the heaviest organism on the planet, as well as one of the oldest. 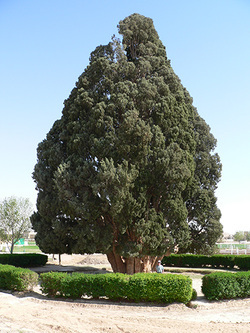 Sarv-e Abarqu: The “Cypress of Abarqu” is an ancient cypress tree located in Abarkooh, Iran. Also known as the Zoroastrian Sarv, this tree took root between 4,000 and 4,500 years ago, making it the oldest living organism in Asia. 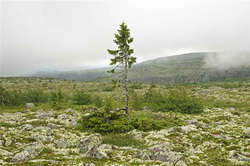 Old Tjikko: Who would think such a scraggy tree could be so old? Do not let looks deceive you. This 16-foot tall Norway Spruce, situated in the scrubby Fulufjället Mountains of Sweden, is an incredible 9,550 years old! This is the world’s oldest single-stemmed clonal tree. The actual tree trunk itself is only a few hundred years old – it is the root system that has stayed alive for nearly 10,000 years. Llangernyw Yew: A rural, Welsh-speaking village in north Wales is the site of Llangernyw Yew, the world’s third oldest, non-clonal tree. 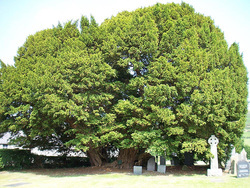 Located in the graveyard of St. Digain’s parish church, among primitive stone crosses made during the Dark Ages, this mighty yew tree has stood here for nearly 4,000 years. 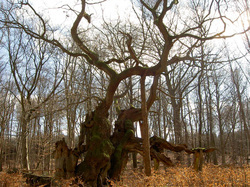 This gnarled, ancient oak tree is set away in the Jægerspris North Forest in Denmark. Scientists estimate the “King Oak” is between 1,500 to 2,000 years old, making it a contender for the title of oldest individual tree in Northern Europe. Though it germinated in an open meadow, the trees growing around it are slowly closing in on the old oak and killing it. 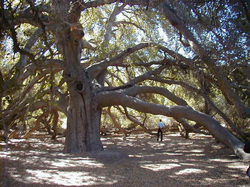 The Pechanga Great Oak Tree - The Great Oak is the largest natural-growing, indigenous coast live oak (Quercus agrifolia ) wi'aashal tree in the United States and is estimated to be 1,500 years old, making it one of the oldest oak trees in the world. The tree has been used by countless generations as a gathering place. 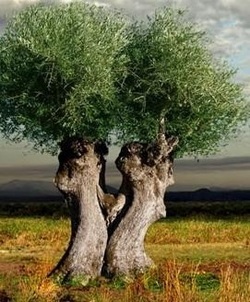 The Olive tree of Vouves (Greek Ελιά Βουβών) is an olive tree in the village of Ano Vouves in Municipality of Kolymbari in Chania Prefecture in Crete in Greece. 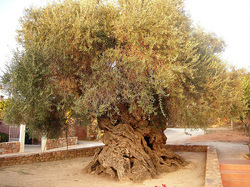 It is known to be the oldest olive tree in the world and still produces olives today. The use of tree ring analysis has proven the tree to be at least 2000 years old. On the other end of the scale, scientists from the University of Crete have estimated it to be 4,000 years old. The trunk has a perimeter of 12.5 m and a diameter of 4.6 m. It belongs to the variety tsounati. It is considered by some a natural monument.